We went to Paige's end-of-school-year program the other night. The kids sang and danced and, to her ultimate delight, Paige's class got to tell knock-knock jokes. (Paige is the queen of Laffy Taffy-esque zingers, always making up her instant classics, e.g., "What kind of ghost does a football squad like? Team spirit.) I loved watching Paige sing her little heart out (she's the kid that sings about 20 decibels louder than everyone else), but my favorite part was at the end. 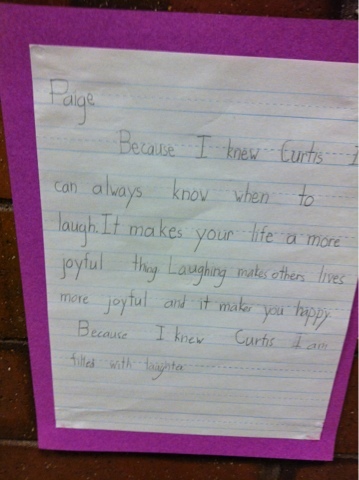 "Because I knew Curtis I can always know when to laugh. It makes your life a more joyful thing. Laughing makes others lives more joyful and it makes you happy. Because I knew Curtis I am filled with laughter." 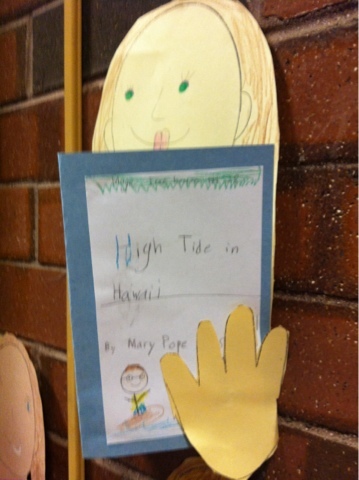 She also made this self-portrait, holding her favorite book, which is (apparently) High Tide in Hawaii. 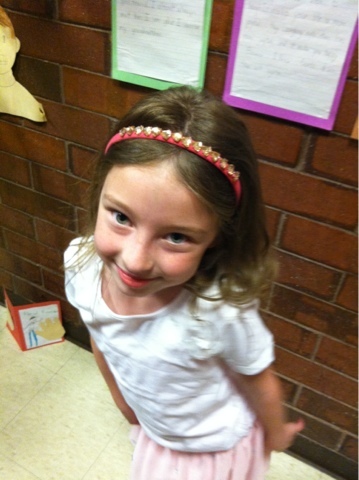 We were happy when we found that Paige had tested into the Advanced Learner program after kindergarten. But we were also a little apprehensive about sending her to a new school. We shouldn't have been nervous. She loved first grade and it's been good for her to be surrounded by other little nerds who love reading and spelling and telling their parents that they are smarter than them (probably true, but still not okay to say). We only had one little problem. Always worried about Paige's social world, I tend to ask her more about who she sat by at lunch than what she's been learning in class. In the winter, I could tell something was up. "Paige, who'd you sit by at lunch today?" "You don't know who you sat by? Who did you play with at recess?" "I mostly just played by...myself." [The sound of my heart breaking] "Really? Why?" "So what did you do exactly?" "I just played in the snow." We went through this for several weeks. She went out of her way to tell me that it was by choice that she was all by herself, and that she really didn't mind being alone...and that she didn't really want me to keep bugging her about it. It's been a good year. Though she (regularly) drives us crazy, we've got a pretty great, smart, beautiful little girl.